Before Joe Mbu hangs up his boots in the summer, the defender will once more attempt to help Edinburgh City through the SPFL pyramid play-offs, but believes the upcoming two-legged tie against Cove Rangers should be the only fixtures that decide who will be playing in League Two next season. City travel to Inverurie Locos’ Harlaw Park for tomorrow’s semi-final first leg against the Highland League champions. Boss Gary Jardine previously voiced his opinion that there should be straight relegation for the SPFL’s bottom club, with the play-off winners going up in their stead automatically. Mbu agrees wholeheartedly. “It’s an absolute joke it’s set up in that manner,” he said. “Some people might complain about the teams in the Lowland League’s fan base and things like that but at the end of the day, it’s a pyramid system – it’s a promotion system. Coming bottom of the league, they shouldn’t always get that final chance. It should be between the Highland and Lowland League to go up. 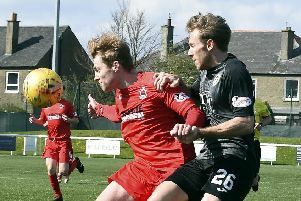 City must first negotiate their way past Cove and Mbu admits the pain of last season’s penalty defeat to Brora Rangers at this stage – his spot-kick come back off the bar – will act as motivation. He won’t be shirking the responsibility from 12 yards if required either. “It will be a motivation for the boys because we felt we deserved to go on and play Montrose last year,” he reflected. “We were on top for most of the game. An error at the back from myself is what eventually cost us but even then we were comfortable defending and looked like we could score. I’ll never say no to taking a penalty either – I’ll always raise my hand to go up for that. Hopefully the heartache of last year will drive us on. Whether City are a league club or not, Mbu won’t be in black-and-white next term. The birth of son Mason nearly eight months ago means the time has come for the former Cowdenbeath man to devote more time to his family. “This is my last year playing,” he revealed. “I’ve enjoyed it a lot, but with the birth of my son and coming in Monday-Friday and seeing him for an hour-and-a-half, it just isn’t working. I’d like to have the weekends to spend with him and the family. It’s been a very exciting time. The year before wasn’t the best but with the birth of the wee man, me and my girlfriend Janice are very happy.